The SDS electric hammer bits are very durable and easy to use and drill holes in concrete quickly. Comes with different sizes and lengths(4x110mm, 5x110mm, 6x110mm, 6x160mm, 8x160mm) with reasonable price. Comes with different sizes with reasonable price. SDS shank, matching with electric hammer perfectly. SDS drill kit with good quality and high precision, durable to use. 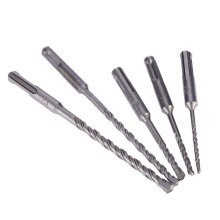 With the 4-flute design, the drill bits removes debris quite efficiently. Suitable for drilling holes in ceramic tile, stone, wood, metal, aluminum, plastic, concrete and multi-layer materials.